Inhibition of tumor angiogenesis is an effective mechanism to limit tumor growth; dual inhibition may result in additional benefit. Bevacizumab is a monoclonal antibody directed against vascular endothelial growth factor (VEGF), and intetumumab is a fully humanized monoclonal antibody that blocks αv integrins when complexed with β integrins. 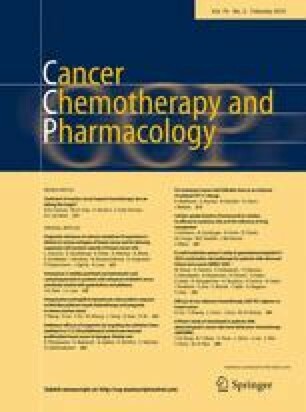 We evaluated the safety, tolerability, and efficacy of the combination of bevacizumab plus intetumumab in patients with refractory solid tumors. We also explored the effects of these agents on plasma-based biomarkers and wound angiogenesis. Patients with refractory solid tumors, Karnofsky performance status ≥70 %, and adequate organ function were eligible. Plasma samples and wound biopsies were obtained at baseline and on-treatment. Twelve patients were enrolled and received study drug. No tumor responses were noted. Observed toxicities included three cases of transient uveitis likely related to intetumumab and one case of reversible posterior leukoencephalopathy syndrome likely related to bevacizumab. Biomarker analysis revealed changes in soluble endoglin, soluble E-cadherin, and soluble E-selectin as well as PlGF and VEGF-D while on treatment. There was no observed impact of bevacizumab plus intetumumab on the phosphorylated or total levels of paxillin in wound tissue; however, an increase in the ratio of phospho/total paxillin levels was noted. Bevacizumab and intetumumab can be administered safely in combination. Bevacizumab plus intetumumab treatment resulted in changes in the plasma levels of several extracellular matrix interacting proteins and angiogenic factors. Hope E. Uronis and Jingquan Jia have contributed equally to this work. We would like to thank the study sponsors, Genentech and Johnson & Johnson (Centocor), for providing support. We would also like to thank the patients and families who participated in this research as well as the members of our research team. Dr. Uronis and Dr. Hurwitz receive research funding from Genentech Roche. Dr. Hurwitz and Dr. Ready serve as advisors and receive honoraria from Genentech Roche. Dr. Nixon receives research funding from Genentech Roche and Johnson & Johnson (Centocor). All other authors have no financial conflicts of interest to disclose. The authors have full control of all primary data and agree to allow the journal to review the data if requested.